It occurred to me that there are lots of new fans as a result of John Carter who may not know about it. 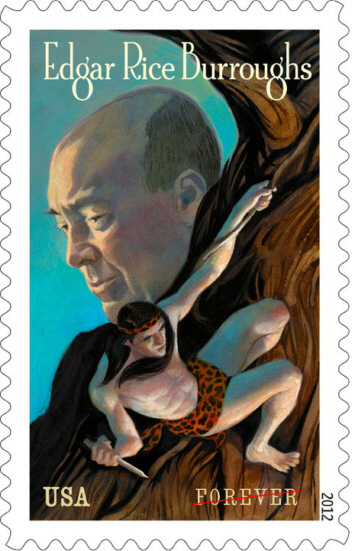 ERB is being honored with a US Postage stamp which will be released and put into service at the time of the Tarzan/John Carter 100 Year Centennial Celebration. The stamp is a “Forever” stamp, meaning it can be used to mail First Class postage forever, regardless of what the rate is. Artist Sterling Hundley worked with art director Phil Jordan on the stamp. The stamp shows Tarzan using a vine to cling to a tree. Burroughs profile can be seen to the left of the tree. Burroughs’ drawing in the stamp is based on a photograph taken by his son in 1934. That’s cool!!! Tell him Thank you! My father Mel Sofian worked hard to make this stamp happen! I am glad his efforts finally paid off. I will be doing the same, Khanada.